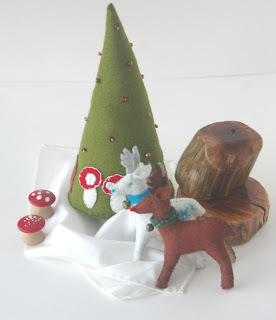 As a thanks to all of our customers and friends this season, I have published a fun little tutorial. 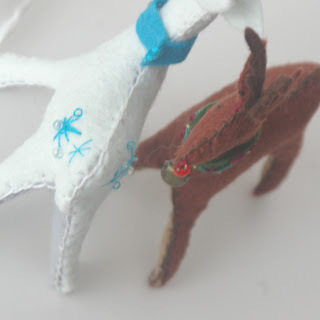 One of Every Reindeer includes 9 pages of instructions, pictures and template to create your own sweet little (3") reindeer out of felt (or fabric). I have listed 10 copies in my shop for $0.20 (the smallest increment Etsy will allow), available to the first 10 people who snag them. I have also listed more of the pattern at a very special price of $3.50 for the remainder of the month. Your pattern will be emailed to you within 24 hours (usually less!). and the trees from a pattern in Fa La La La Felt.